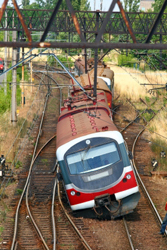 Railroad accidents cause serious injury and death. Given its massive weight, a train takes 18 football fields to stop from a speed of 55 mph. To prevent accidents, railroads must exercise a high duty of care and comply with state and federal safety regulations. Railroad Crossing Accidents. Illinois is second overall in the nation for highway-railway accidents. In the past five-years, 364 Illinois cities have reportedly had a train-vehicle collision occur at a grade crossing. Improper signage or a mechanical malfunction of a safety device at railroad crossings can lead to vehicle collisions. People involved in a train collision are 40 times more likely to suffer death than a vehicle collision. John J. Malm & Associates is an experienced personal injury law firm representing individuals and families who have suffered an injury or loss due to an accident. You may be entitled to a substantial settlement if you have been injured. Call 630-527-4177, or 312-422-6855, and speak with Attorney John J. Malm.